This Stainless Steel Fried Ice Cream Machine 1 Round pot, connect to the power supply and turn on the refrigeration switch before stirring the mixture of drinks such as juice, milk, cocoa, with an available ice slush shovel. Our fried ice machine operating a wide range, flexibility, compared with similar products, power consumption is extremely small, energy-saving effect is remarkable. 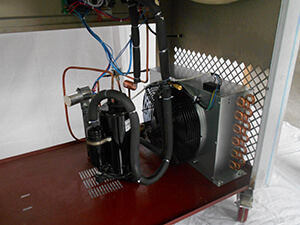 Use the state-of-art refrigeration technology on our machine to offer excellent design and good performance. Compact in size, light in weight, easy to move and safe to operate. It is durable and fit for the various environment. Here’s how it works. You order a base flavor (chocolate, matcha, plain, vanilla, yogurt, Yakult), and add in mixes of fruits, cookies, and sauces such as Nutella. With nimble hands, poured a mixture of green onto a cold metal surface, added in the mixes, ‘chopped’ up the blend with two towels, and spread that across like a thin sheet. The whole process will take about 2 minutes.